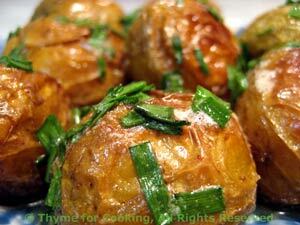 Roasted New Potatoes with Chive Butter, Thyme for Cooking sides. New potatoes are early, tiny, immature potatoes of any color, usually 1" (2.5cm) or less in diameter. They have a high moisture content, are very creamy and usually cooked whole. If you can't get new potatoes, use regular potatoes, cut into 4ths or 6ths. Leave potatoes whole and unpeeled. Just wash lightly. Toss with oil, lightly salt and put into a baking dish large enough for them to be in a single layer. Bake at 400F for 30 minutes. Stir half way through baking time. Remove from oil and put into a small dish. Add butter and chives, toss to coat and serve.